This entry was posted on September 27, 2012, in Food From Afar and tagged Breakfast, Cuban, Dessert, Latin American, Mexican, Peruvian, Playground, Soul, Southern, Tacos, Vegetarian. Bookmark the permalink. I spent five years of my life toiling away in the Psychology building at UGA and four of those commuting from Atlanta. And while I don’t miss that commute for one second (and regret not having XM radio), I often miss the small town feel of Athens, only an hour’s drive (and change) from Atlanta. For my birthday, I decided to head to Athens for the day with my husband, sister, and My Little Foodies in tow to check “flying trapeze” off my bucket list. My first stop, however, was brunch at Five Star Day Café, a familiar spot across from the “Arch” that I clearly remember frequenting with friends to commiserate on the politics and pressures of graduate school. This kitschy, soul restaurant “serving down home comfort daily” always sported long lines out the door. It hasn’t changed a bit. While Big A opted for the classic eggs and bacon with a star biscuit for breakfast as well as a few bites of her Daddy’s Blueberry Oatmeal Pancakes, I split the Hot Buttered Soul Chicken with Little A. 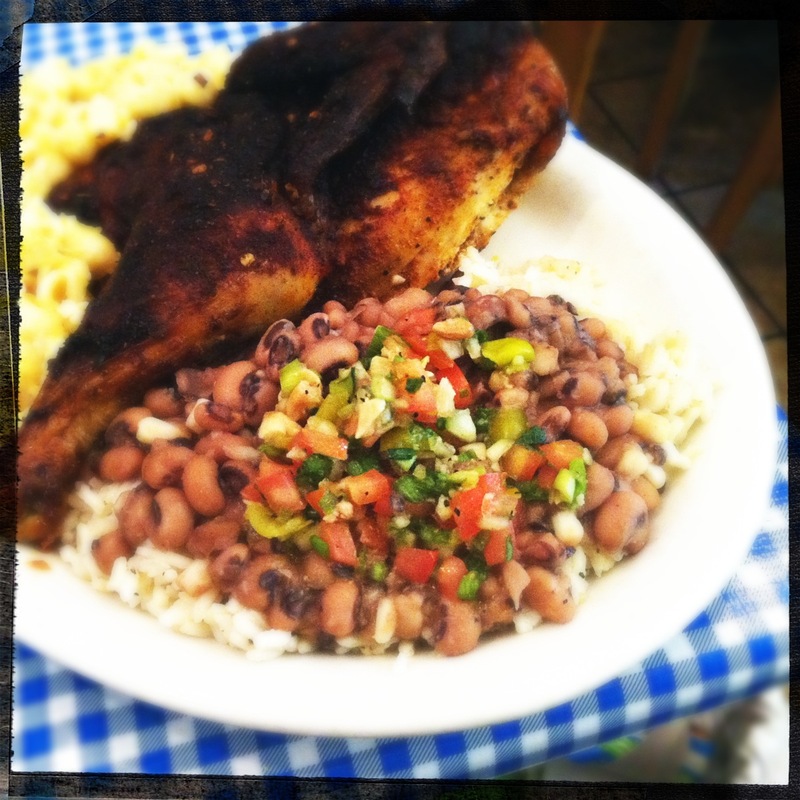 This half chicken basted in herb butter and coated with Jamaican seasoning, is served with hoppin’ john (a bed of black-eyed peas, corn, rice with a tomato, cucumber, and garlic relish) plus an additional side (I opted for the creamy mac n’ cheese), and makes for a huge meal, plenty for two. I immediately recognized the same comforting sensation this meal gave me as I would indulge after a stressful exam, and Little A enjoyed it too. We then strolled the streets of downtown: eerily quiet during the summer. We took in a little shopping waiting for the main event. 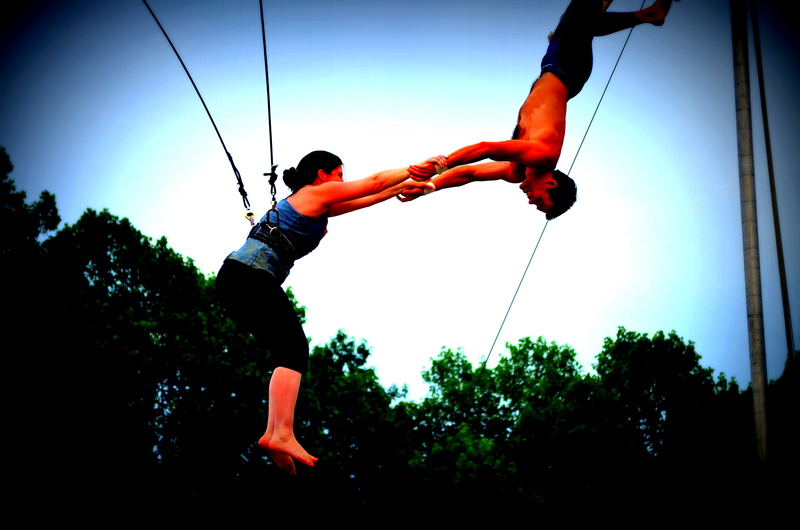 I was thrilled to finally visit Leap Trapeze School for a two-hour lesson with my sister. My friend from graduate school (also a psychologist) and her husband, who she met while working at Club Med after college, decided to return to Athens a couple of years ago and open this fantastic facility with friends. As I strapped on my harness and listened intently to all of the instruction along with the rest of my group (mainly teenagers), I realized I might be having a bit of an early/mid-life crisis. After only a few minutes, I found myself scaling a ladder, and My Little Foodies watched wide-eyed at their mommy taking flight and dismounting with a back flip. The weight of the world was simply lifted, and I was so excited that my family was there to watch my exhilaration. What an amazing activity, and something you can do with the entire family; kids as young as four can participate. Within the first 20 minutes of the 2 hour class you will be flying and practicing basic tricks for execution and timing. At the end, you even get to attempt a mid-air catch. This is worth a trip to Athens for a family adventure, or even a great idea for a birthday, no matter what age! My Little Foodies were getting restless for dinner after patiently watching, so we stopped off at Cali n Tito’s at the end of sorority row for a bite before heading back to Atlanta. This place must contribute heavily to the freshman fifteen, because the Latin food (a mix of Mexican, Cuban, Peruvian, etc) here is deliciously fresh, inexpensive, and served in large portions. We arrived on the late side for a kid’s dinner, and the line to order was almost 45 minutes long. Fortunately, that didn’t phase My Little Foodies one bit, because they were totally preoccupied with the shabby, chic, and repurposed playground built-in the middle of all of the outdoor tables. 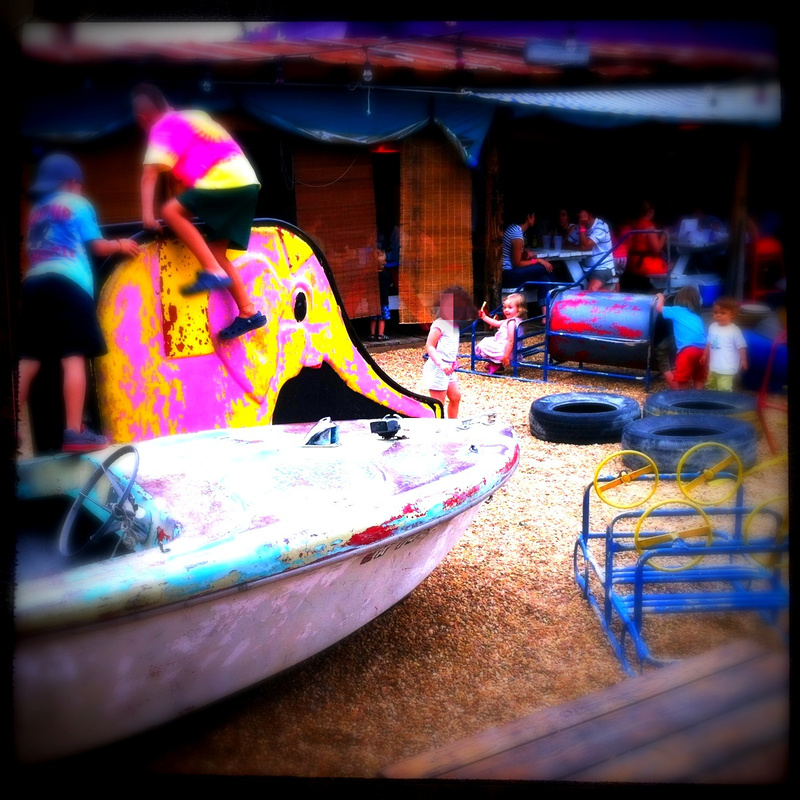 Diners, who are allowed to BYOB for $2.00, were jovial as masses of kids played tag, hung out in a dilapidated, old boat, and took turns going down the slide. There is even a huge birdcage filled with exotic species mimicking the voices of little ones who watch transfixed. The family shared items off the “Something Different” section of the menu. Nothing too unusual, but still more authentic than the wings they have on the menu to appease the frat boys. El Gran Combo was a platter of grilled steak (I subbed chicken) with pinto beans, rice, sweet plaintains, avocado, and fried eggs. I happily shared this deliciously seasoned dish with Little A with plenty to spare. Big A enjoyed a chicken taco served with red cabbage, cucumbers, cilantro, and onion. 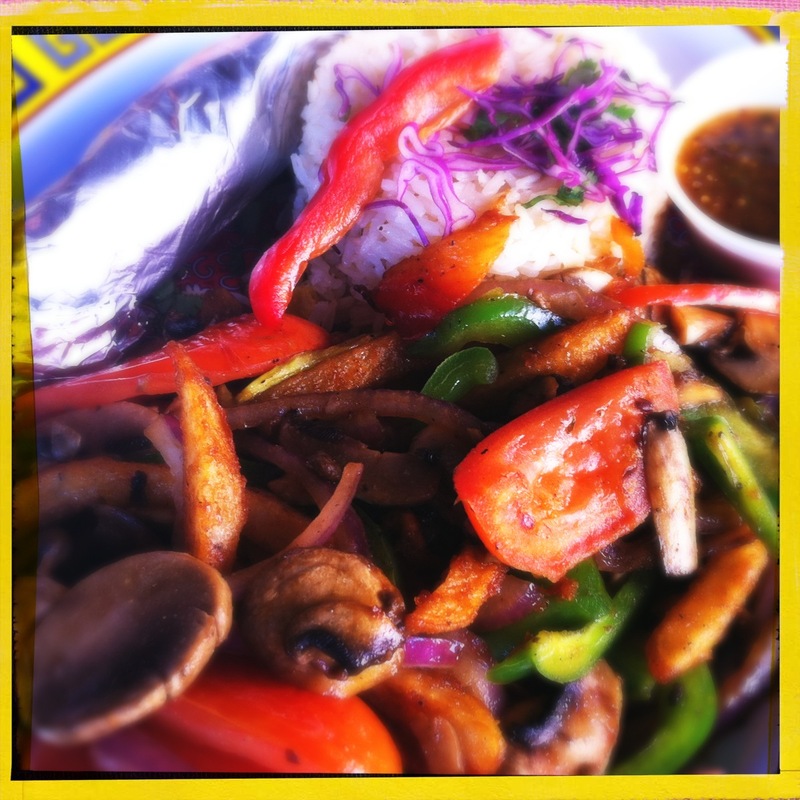 She was also entertained by her father’s Veggie Saltado, a vegetarian take on traditional Peruvian dish with marinated mushroom grilled with green and red bell pepper, onions, tomatoes, zucchini, and fries all tossed together. Of course, we couldn’t get out of there without Big A first spotting her favorite rainbow-umbrellad popsicle vendor, King of Pops. This Athens outpost is perfectly located on the restaurant’s playground, like a stranger beckoning children with candy. Like responsible parents, we denied her request for Chocolate Sea Salt so late at night. It was a good thing she passed out quickly in the car, however, so we could indulge on couple of pops (Banana Puddin and Coconut Lemongrass) we snuck for ourselves on the car ride home!